Some desserts are created just for pleasure alone while others, like the opera cake, were made with a specific agenda in mind. Legend has it that the dessert L 'Opera was created to help patrons of the opera stay awake during long performances. This is entirely possible considering the amount of sugar and concentrated coffee that is use to make an opera cake. The components of opera cake are not complicated to make but the assembly can take some practice to perfect. My one word of advice to the baker who is trying this dessert for the first time is to take it slow. This is not a quick dessert to begin with; it needs time to rest in the refrigerator. Opera cake uses some special ingredients that you might not have on hand. 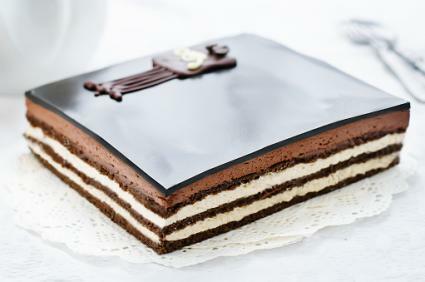 Before you start to make your opera cake, make sure that you have almond meal, cake flour, and coffee extract handy. Unfortunately you cannot substitute almond meal or cake flour with anything else, but if you find coffee extract to be elusive, you can make a reasonable facsimile by using instant espresso. You will need 4-ounces of coffee extract for this recipe so start with 4-ounces of water and add instant espresso, one teaspoon at a time, until it becomes slightly thick. Sift the 3-ounces of sugar and the cake flour together into a bowl. Add the whole eggs and mix until completely incorporated. Whip the egg whites with the sugar until a medium peak forms. Fold the fluffy egg whites into the batter. Add the melted butter and gently fold until mixed. Spray a half sheet pan with non-stick spray, line it with parchment paper and spray again. Bake for 8 to 10 minutes or until light golden brown. Place 2 cups of sugar in a saucepan with 1 cup of water. Let the liquid simmer until the bubbles hold for three seconds. Add 2 ounces of coffee extract. Heat the cream over a medium flame until it just starts to simmer. Place 10 ounces of chopped semi-sweet chocolate in a heat proof bowl. Let sit for a minute or two, then whisk to combine and melt the chocolate. As the ganache cools, whisk it briskly for a minute or two every five to ten minutes. In a small saucepan over a medium low flame, heat 1 ounce of water with 2 ½ ounces of sugar and 1 ½ ounce of light corn syrup. While this is heating, beat the egg yolks to a thick, light consistency. Once the syrup gets to 240 degrees (a three or four second bubble), remove the syrup from the heat. While beating the egg yolks, slowly pour the syrup into them. Continue to beat the mixture until it becomes cool, close to room temperature. Add the butter slowly, a little at a time. Beat in the coffee extract. Cut the joconde cake into three equal parts. Soak the first layer with the coffee syrup. Spread a layer of the whipped ganache about as thick as the joconde layer. Place a second layer of joconde on the ganache layer. Soak this layer with coffee syrup. Spread a layer of the coffee butter cream onto this layer of cake as thick as the joconde layer. Place the last piece of joconde onto the cake and soak it with the coffee syrup. Spread a thin layer of ganache on this layer. Let cake rest in your refrigerator for at least four hours. Melt the 4-ounces of semi sweet chocolate and pour into a piping bag. Cut the cake into 2-inch squares. Pipe the words "L'opéra" onto each square. While this may not be the easiest recipe to make, the taste is well worth the effort. It's the perfect ending to any French meal. You may even want to try it before your next trip to the opera, to see if the legend is true!